Finland and The Latest Worldwide Meteor/Meteorite News in Tokyo, Japan. 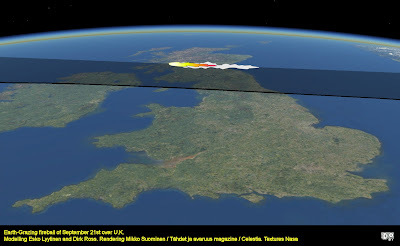 According to the modeling done by Finnish mathematician Esko Lyytinen, the big UK fireball of the 21st of September was captured by Earth`s gravity. After one circle around the Earth one of the remnants seems to have re-entered the skies over North America. 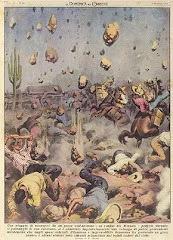 "It looks now that the fireball witnessed 155 minutes later in US and Canada, may have been one fragment of the British fireball, most probably the biggest one. This was its second entry into the Earth`s atmosphere", Lyytinen says. "If so, this is very rare observation, but it needs to be confirmed." The large meteoroid entered the atmosphere with a very low speed of approximately 13 km/sec, only a little more than the escape velocity. Due to the low velocity and angle of entry the gravity of Earth pulled the meteoroid and curved its trajectory. This made the exceptionally long passage in atmosphere possible. "I estimate that the fireball came to its closest point at 53 kilometers above the Earth", says Lyytinen. The entry mass of the asteroid has been estimated to be in the range of tons of kg or tens of tons. Probably a significant portion of the mass was lost during the luminous-flight fireball phase. Videos taken of the UK event show that the fireball fragmented into multiple pieces. According to Lyytinen, the deceleration during the fireball phase left the meteoroid at the speed of only 9.2 km/sec as it was leaving the atmosphere. Hence it remained travelling around the Earth until it re-entered the Earth's atmosphere. "After leaving the atmosphere it probably made about a full revolution around the Earth before re-entering", Lyytinen says. Lyytinen predicted two days ago, that the US/Canada fireball might be a part of the same event. 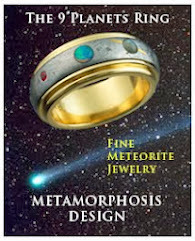 The idea was studied yesterday by Dr. Robert Matson, an aerospace engineer and meteor expert. Matson found that the direction of fireball over Quebec seems to fit the prediction. Moreover the required speed for this space rock according to Matson to show up at the observed times over UK and America is 9.08 km/sec, which is excitingly near Lyytinen`s value. Matson in his study also had independently concluded that the UK fireball was starting to rise up at the end of the observed track. 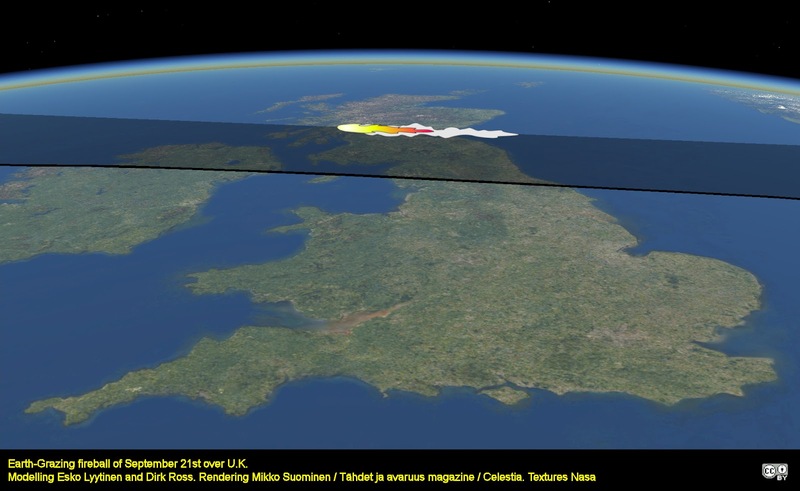 Lyytinen estimates, that during the fireball`s long first flight over UK it was visible from the ground for almost a full three minutes. "I have no information of a similar duration of a fireball ever being observed", Lyytinen admits. "Naturally it is theoretically possible, but this is so rare that I'm amazed that it really happened." "The great daylight fireball of August 10, 1972 over North America was similarly magnificent, but it was notably faster and shorter in duration", he says. The Earth-grazing meteoroid of 1972 has been estimated to have lasted 100 seconds before returning to space and leaving the Earth's gravity. Esko Lyytinen is a mathematician of the Finnish Fireball Working Group of the Ursa Astronomical Association. 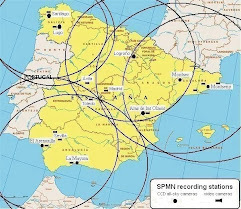 In this research he co-operated with Dirk Ross of Tokyo, Japan who operates a website, "The Latest Worldwide Meteor/Meteorite News", which continuously monitors meteor events worldwide. Green meteor seen over Cape Town , South Africa this evening about 20h15. I saw a meteor/asteroid while in Cape Town on the 28th September at the same time as Jason (about 20:15). It appeared red at first and moving fast (was it moving towards me perhaps?) then it seemed to quickly change direction and pick up speed. I then realised it was a meteor/asteroid as it had the most beautiful green tail.